ISLAMABAD July 18, 2010: Childhood is marked by innocence and lack of awareness regarding good or bad. Children see towards elders and parents for guidance and help and on the base of it they make an informed choice later as they grow old. But sometimes parents and elders misguide these young, visionless souls in order to exploit them in the line of their vested interest. Talented children are an asset of a society but they run a risk of being misused by the elders and are often negated their rights in pursuing lust for money. Iqra Shabbir, 9 is such a girl who is proving herself an eye candy for visitors in ‘Sawan Mela’ at Lok Virsa these days. She is attracting large number of spectators by showing her marvellous aerial tricks. Jumping in air like Superman and making angles with her arms is really fantastic. “I was only three years old when I started performing these stunts and now I have an experience of 6 years. I enjoy a lot my performances and I want to make a big name in this art” said Iqra Shabir while talking to this news agency. She further told that this is the art of her ancestors and she got training from her father who has been doing all this for 34 years. The most painful thing which Iqra told is that she is not studying in any school because she thinks that basic education is not her need. “I don’t want to go to school because I have no interest in books and I am very happy with what I am doing,” she said with an indifferent face – it did not seem to be her informed choice yet. 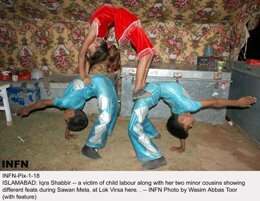 Iqra executes her gymnastic tricks with the help of Nadeem and Ali, her cousins. They also have no interest or link with school and books and are happy only with their gymnastic stunts. When they were asked about religious education, they told that they are getting basic spiritual education at their camps. Shabbir Ahmad, father of Iqra said that he is very happy with his life as he passed it as a genuine artist, giving smiles to the people. “I have only one complaint against public that they are not giving us such respect which an artist deserves,” he said while telling about the response from people. He further said that he can’t send Iqra to school as they have to travel extensively for performing their art in different “Melas” and functions. “As we are not permanent residents of any particular place, it is not possible for Iqra to join any School” he excused. Adopting art of forefathers and showing gymnastic stunts is not a bad practice itself but when it is done at the cost of essential education which is the basic right of every human being, it should be rechecked. Iqra Shabbir being only a nine-year-old girl is too young to understand the way she has been cruelly brain-washed and trained to happily burn in the eternal fire of child labour depriving her from the right of getting herself educated.